From a young age, I’ve been an avid writer. I would always make little paper books, some of which I still have ten years later! I have always enjoyed writing, so it was no surprise that I was thrilled to hear that an author was coming to run a program at my school that would enable me to write, illustrate, and publish my very own children’s book. 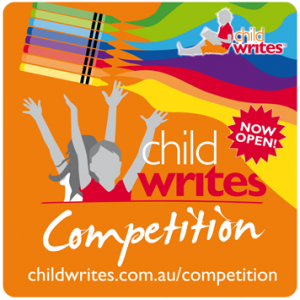 Child Writes, an Australian programme, provides the opportunity for “children to write for children, supporting children.” The program involved a two-hour session every week with the local author, not to mention the extra hours spent brainstorming, writing, and drafting. This also meant that I spent my holidays drawing and painting—not that I minded at all! It was a dream come true when I held my book for the first time. As stoked as I was, I knew that it would not have been possible without the hard work of many people, including myself. Making a book is no easy task, but it is well and truly worth the continuous writing and editing, the late nights spent at the computer, the drawing of a picture 20 times until it was perfect, and all of the practice. During our weekly sessions, we had to brainstorm, write short stories, and draw pure contours. It took a few sessions before we really got going on our own books, but the practice certainly helped. I published my first book, Too Busy for Lizzie, when I was ten and the following year I wrote another, Lizzie in the Bush. I have since thought that maybe I shouldn’t have used the same character. I guess I have learned my lesson, which is a good thing because that is the only way you can really learn about yourself as a writer. By trying different things and different approaches, you can find what suits you and your stories. 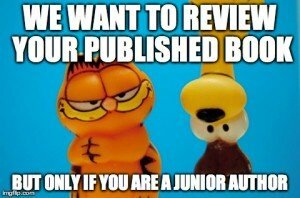 Do you know a young writer who has self-published a book? We want to review it. Click for submission info. As well as printing our own copies, the books were donated to a hospital and the school, as well as local, state, and national libraries. Recently, as I was reading the newspaper, I came across a review for my book. It’s just unbelievable! It is heart-warming to see people you don’t even know enjoying something you created. A few years ago, all books from Child Writes were published as eBooks with a different selection available monthly on the iPads of JETSTAR flights. Child Writes allowed many children like me to fulfil their dreams. It may be the end of my children’s book collection for a while, but participating in this program has enabled me to live out my passion for writing. I have learned many things that I can apply to all aspects of my writing. Don’t ever give up. Always remind yourself why you started writing and why it is important to you, no matter what the circumstance. Try anything and everything until you find what is right for you and then just keep writing! If there are any similar programs to Child Writes around, I would highly recommend giving them a shot. Writing a book is such an incredible experience. Thank you, Child Writes, for helping me to live out my dream! Emily Bruggemann is a 15 year old writer from Australia. She says “I have been writing for as long as I can remember, and I’ll keep writing until I no longer can.” Emily placed second in her category in the 2013 Junior Authors Short Story Contest.